Application Menu: Contains application functionality for saving and opening connections, creating a new database, updating a database, application options, registration entry, and workspace options. Connection: The database connection screen can be accessed in two areas: (1) the backstage menu Connect tab, and (2) at the bottom-center of the EQuIS Professional window (click database connection information). EQuIS Professional Ribbon: Gives you access to the primary Professional functions (Import/Edit/Open/Graphic Tools) as well as several tabs of interface options. Import: Allows you to import data using EDP, EDP Express, and the EQuIS Facility Migration. You can also publish reports and forms with the Publish drop-down. Edit: Provides GUI access to Action Level creation, and Facility/Analyte/Location group creation. Open: Gives quick button access to open data tables, reference tables, forms, views, reports and system tables. Graphic Tools: Offers lithology, Isopleth, and vertical profile tools. EarthSoft: This section provides shortcuts to Enterprise and EDGE. 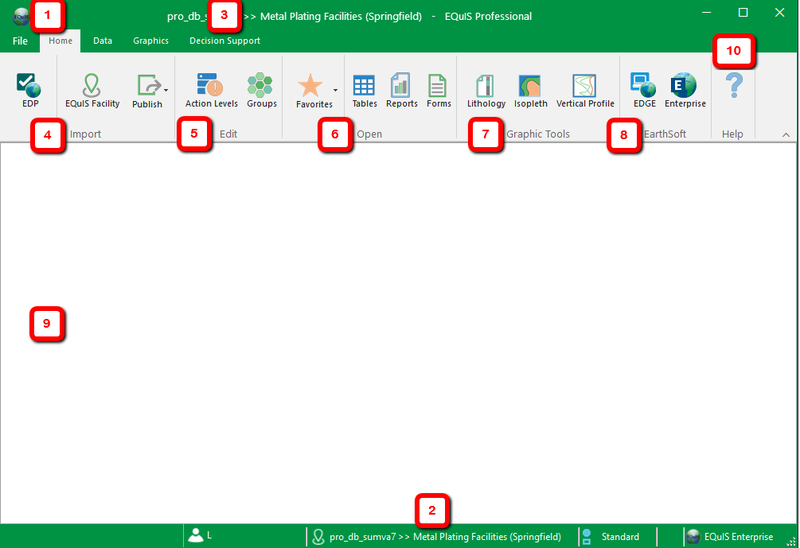 Workspace: This is where the data tables or reports are displayed in tabular format as well as the different parameter selection options for reports, the edit GUI windows, and interface exports. Help: Opens context sensitive help from within Professional to the EarthSoft Online Documentation.